This is an all natural* product that has many health benefits and includes approximately 12 treatments. 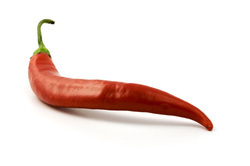 Chili Wrap is a unique slimming concept that not only assists a person in achieving centimeter reductions, but is also very effective in treating cellulite and firming and toning of the body. It is important to note that you do not need to be overweight to have cellulite – as it is not as such a weight problem, but a combined dilemma of increased fat cells, waste accumulation and inadequate circulation. Once every two or three days the “Chili Wrap” cream must be applied. The body is the loosely covered with a medicinal wrap to help with the absorption and penetration of the cream into the body. The client will remain wrapped in the full body wrap for at least an hour and during this time should not be very active. It is of the utmost importance that the client does not sweat during this period. The active ingredient of “Chili Wrap” is capsicum which means “to Bite”, in Greek. The reason for this being capsicum’s ability to increase the body’s heat production with return speed up the metabolism of fats and carbohydrates. But no matter how it burns, it is good for you as capsicum contains many medicinal properties! On non-wrap days the client will apply the “Chili Curves” cream every morning, after a hot bath or shower, onto the body. The active ingredients of “Chili Curves” are Ivy extract, known for its slimming and anti cellulite properties, as it prevents water accumulation in skin tissues. Ivy extract also lowers tissue sensitivity, activates circulation and helps reduce local inflammation. It contains malice acid, a natural fruit acid that encourages skin cell turnover. The products are made up purely of natural ingredients and are safe with no side effects. For best results always use in combination with a healthy diet and exercise plan.